Water from melting snow eroded many of the geologically recent gullies on Mars — and snowpacks still linger on many poleward-facing slopes in the middle latitudes. The discovery of fresh-looking gullies on Martian slopes in 2000 strongly hinted at erosion by liquid water in recent times. However, Mars' cold climate at present makes it difficult for water to be liquid near the surface, except briefly near the equator. Groundwater seeps might offer an explanation, but the gullies lie mostly in mid-latitudes, where temperatures are colder than the equator - and, moreover, the gullies tend to occur in groups on isolated buttes, mesas, and other sites where prolonged groundwater seepage is unlikely. Images taken at visible wavelengths by the Thermal Emission Imaging system (THEMIS) on the Mars Odyssey orbiter suggest a solution. In this model, liquid water flows occasionally from a layer rich in dirty snow that mantles many of the slopes where gullies occur. As the snowmelt trickles out, it cuts into the ground, eroding a gully in perhaps 5,000 years. The snow-rich mantling material, dubbed by scientists "pasted-on terrain," is widespread on Mars from 30° to 70° latitude in both hemispheres. Blanketed by dust and dirt, this snowpack covers slopes with a layer about 1 to 10 meters (3 to 33 feet) thick. It appears most commonly on slopes facing toward the pole and away from the Sun, often on the same slopes that contain gullies. Scientists think the origin of the dirty snow lies in climatic changes on Mars during the last 100,000 to a million years. Over such periods, the tilt of Mars' polar axis can vary from as little as 15° to more than 35°; currently, it's 25°. Computer models show that during times when the axial tilt is large, the polar regions grow warmer (averaged over the year) than the equatorial regions. This causes snow and ice evaporate from the poles and accumulate at low latitudes, giving the planet an equatorial snowbelt. Then Mars' axis swings back toward a more upright position relative to its orbit, and the low latitudes give up their snow and ice to the poles again. Right now, say planetary scientists, Mars is emerging from an equatorial Ice Age. The pasted-on terrain is a dirty snowpack - a remnant that's vanishing as the mid-latitude climate warms. And gullies appear as the snow melts and trickles away. Remnants of the snowpack still lie on many mid-latitude slopes, and liquid water is there now or has been very recently. This makes the pasted-on terrain a potential abode for life - and a key target for future exploration. 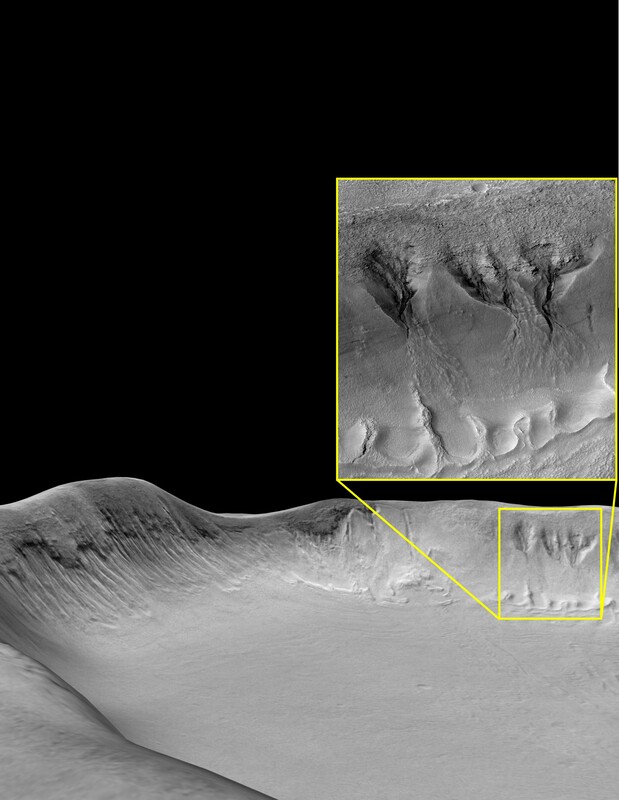 Christensen, P.R., Formation of recent martian gullies through melting of extensive water-rich snow deposits, Nature, 422, 45-48; doi:10.1038/nature01436, 2003. A THEMIS image shows gullies and a mantling layer of dirty snow where the layer has partly evaporated under solar warmth. A portion of THEMIS image V01229004 is superimposed on a landscape model produced from laser altimeter data. The area is about 16 kilometers (10 miles) square and has a resolution of 18 meters (59 feet) per pixel. The inset shows a portion of a high-resolution MOC image of the gullies. (THEMIS image courtesy NASA/JPL/Arizona State University and MOC image courtesy NASA/JPL/MSSS.) Figure from Christensen, 2003.